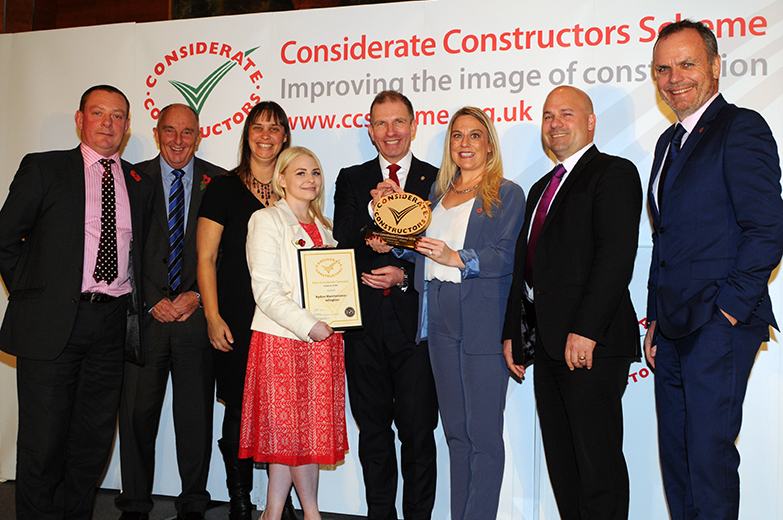 The Considerate Constructors Scheme crowns the Most Considerate Companies and Most Considerate Supplier at the 2016 National Awards. 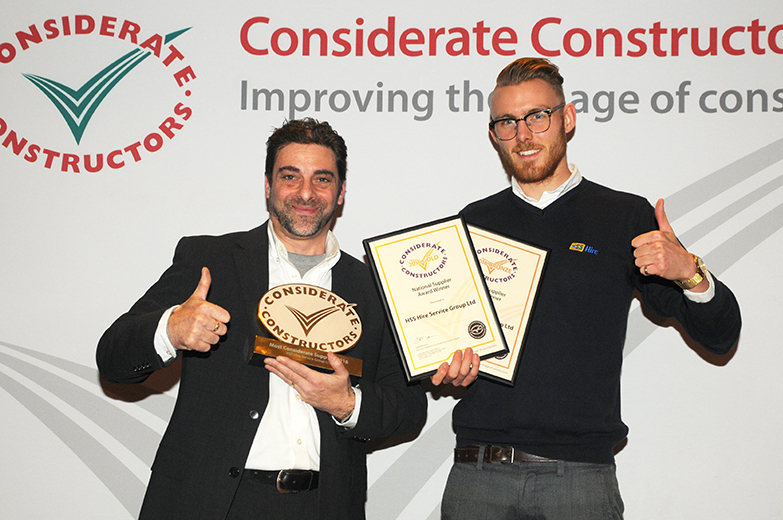 Four companies were presented with the coveted top award of ‘Most Considerate Company 2016’, they are: Connect Plus Services (annual turnover: £10m and over); Rydon Maintenance – Islington (annual turnover: £3.5m to <£10m); Linfoot Country Homes Ltd (annual turnover: £250k to <£3.5m) and Solent Industrial Roofing Systems (annual turnover: Under £250k). 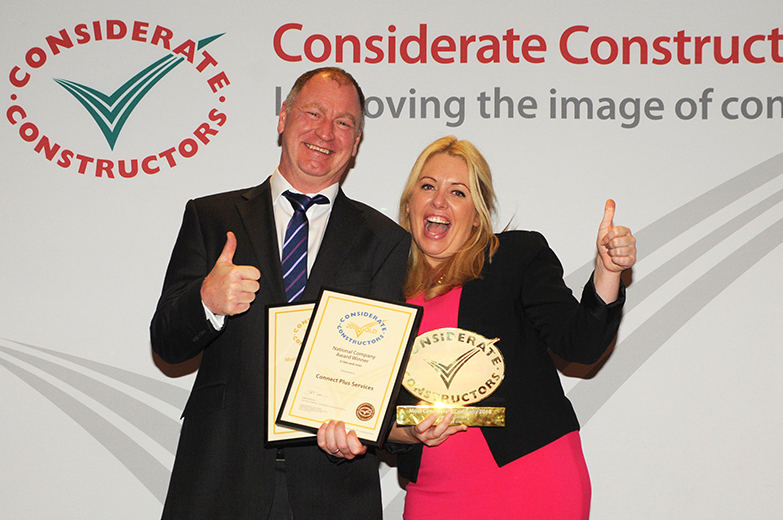 HSS Hire Service Group Ltd triumphed as the ‘Most Considerate Supplier 2016’, making them the first registered supplier to win this prestigious title since Supplier Registration was introduced in 2014. 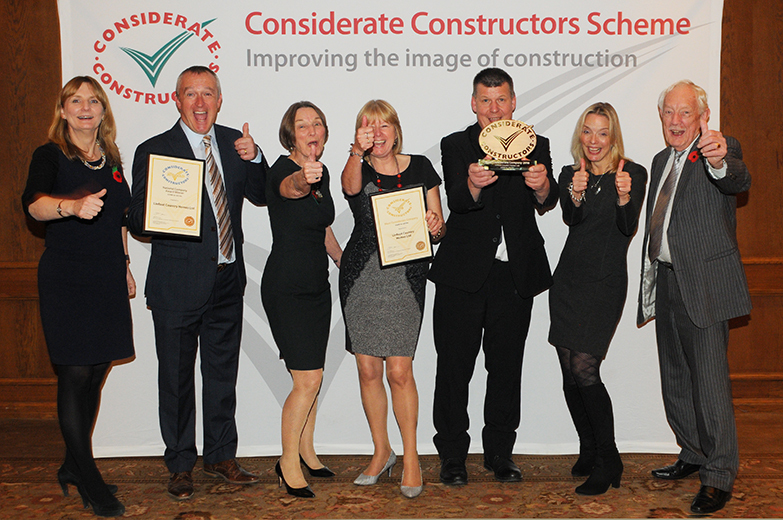 The Considerate Constructors Scheme’s National Awards are one of the most respected accolades in UK construction. By registering with the Scheme, companies and suppliers demonstrate a strong commitment to improving the image of the industry. The awards recognise the highest performing companies and suppliers which have demonstrated excellence in relation to the community, the environment and their workforce. 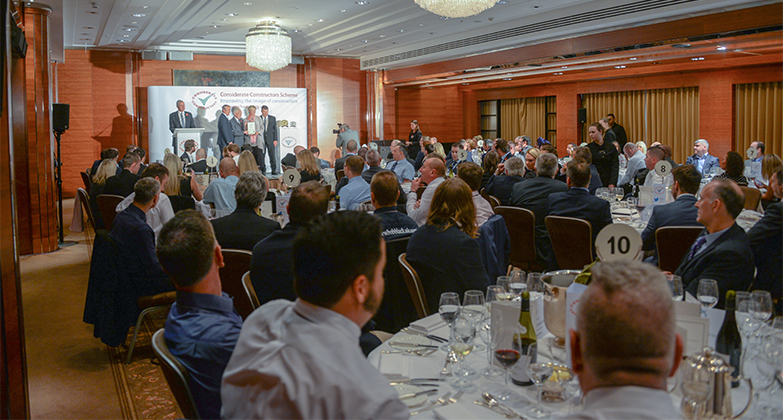 The prestigious awards ceremony took place on 10 and 11 November at the Four Seasons hotel in London and were presented by special guests Liz Male, Chairman of TrustMark and Richard Beresford, Chief Executive of the National Federation of Builders. In total 21 Gold, 32 Silver and 43 Bronze Awards were presented to registered companies, and two Gold, one Silver and four Bronze Awards to registered suppliers. 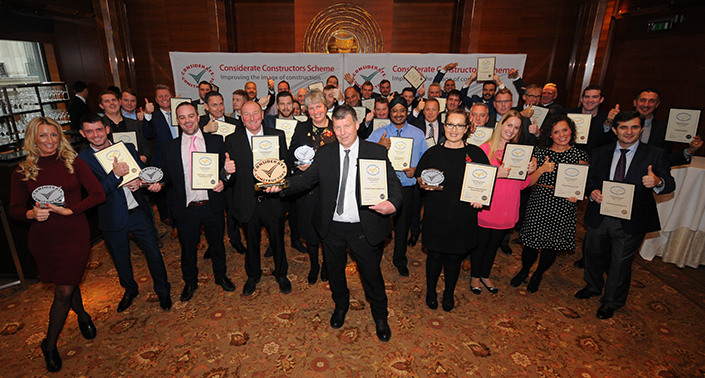 Of the Gold Award winners, seven companies were shortlisted and received the ‘Most Considerate Company Runner-up’ and one supplier the ‘Most Considerate Supplier Runner-up’. Connect Plus Services undertakes planned and reactive highway maintenance works to sections of the M25 motorway and its key arterial link roads, as part of a 30-year contract with Highways England. An enthusiastic team is constantly striving to improve its considerate performance and a continual refinement of depot and site safety is just part of this ongoing aim. A training matrix has been increased across the business, with supervisors being trained to site manager level and some operatives to supervisor level. Each member of the workforce also receives emergency first aid training and a £50 monthly award is presented to the employee of the month. Care for the workforce is an obvious priority, with wellbeing checks increased from annual to six-monthly, and medical information and contact details held at all depots. The community is also at the forefront of operations, with all depots adopting a local school to provide safety presentations, career information and practical support. A great deal of importance is also placed on recruiting young people, as demonstrated by the company’s extensive graduate and apprenticeship programme involving the Prince’s Trust and a CITB construction college. This company’s evident enthusiasm for considerate construction is helping to raise the bar for the entire industry. Rydon Maintenance (North London Region) is in the 13th year of a long-term contract with Islington Council for the repair and maintenance of more than 6000 properties. This potentially intrusive work demands a high degree of care and consideration – aspects that are now hallmarks of the company’s activities. One particularly notable initiative was the use of a high powered vacuum cleaner to clear gutters, enabling an operative to use an extendable tube at ground level, guided by a remote camera. Acting on residents’ concerns, this was developed by the company to eliminate the need for scaffolding. The company’s environmental procedures are also exceptional, with a new scheduling system minimising driver journeys and reducing carbon emissions. Outstanding support of the workforce includes the addition of a mental health first aider within the company and a mental health awareness event. Linfoot Country Homes Ltd is a family-owned business specialising in properties in rural areas in the South Midlands for over 20 years. 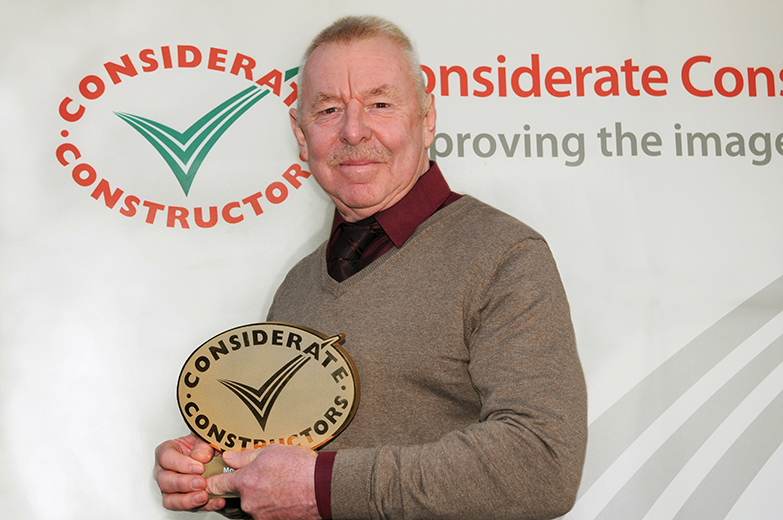 Working with housing associations and local communities to provide attractive, affordable housing, the company has demonstrated a long-term commitment to the Scheme’s Code of Considerate Practice. Projecting an impeccable industry image, sites display smart company and community signage, accompanied by a strict adherence to its own branded workwear, set off by clean, tidy roads and smartly defined site boundaries. Care for the neighbours and surrounding community is an obvious priority, with support and donations given to local good causes, charities, businesses and community events. A connection has been made with a local high school and a varied list of events hosted, such as career and construction talks to the students, business enterprise initiatives, site visits and work experience. In environmental matters, recycling records are displayed on site together with graphs showing water and power consumption, as well as measures aimed at minimising usage. Whilst striving constantly to achieve yet higher standards, the company projects an image that is a credit to all those responsible, thanks to its abiding commitment to the Scheme. Marymount Associates Ltd, trading as Solent Industrial Roofing Systems, is based in Portsmouth, Hampshire and specialises in roofing services to the industrial, commercial and domestic sectors. One recent project was for a storage building on a military base in Wiltshire and the company spared no effort ensuring that the development was sensitive to the client’s operations and fully in accordance with the security standards required. The working area and site compound were excellently presented, clean and tidy, and similar standards applied to the appearance of operatives on site. Taking a similarly considerate approach to the environment, a thorough ecological survey was carried out and appropriate action taken. Site accommodation was powered by a diesel generator, which was fully sound suppressed, while vehicle sharing was commonplace. The company clearly demonstrates that safety is of paramount importance. The site manager has a process of daily checks in addition to regular audits supported by the client’s own monitoring. Contact and medical information that may be required in an emergency is recorded at induction. The company’s commitment to the Scheme and the determination to achieve high standards make them a worthy representative of the industry. HSS Hire Group is a leading provider of tools, equipment and related services in the UK and Ireland. The group caters for a wide customer base, from large blue chip companies to smaller local businesses and across many sectors. Undertaking deliveries from one of the busiest depots at Mitcham is no easy task but HSS Hire Service Group Ltd has robust policies and procedures in place to ensure professional, safe and efficient operations. Cutting a smart corporate image, all vehicles are immaculately presented with highly visible signwriting and corporate colours conveying the company values. Even the operating tickets attached to tools were similarly branded, illustrating the importance for HSS of projecting a meticulous image for the industry. Taking a stringent approach to safety, drivers’ licences are regularly checked and training stresses the importance of showing courtesy and respect to other road users. The company is always striving to raise safety performance, with no accidents reported in the previous year. Ensuring the safest FORS-accredited fleet possible, all delivery vehicles are replaced on a three-year rotation to ensure the highest possible standards. Operating at exceptional levels, this company goes above and beyond to ensure the highest standards of considerate practice. Congratulations to all award winners. 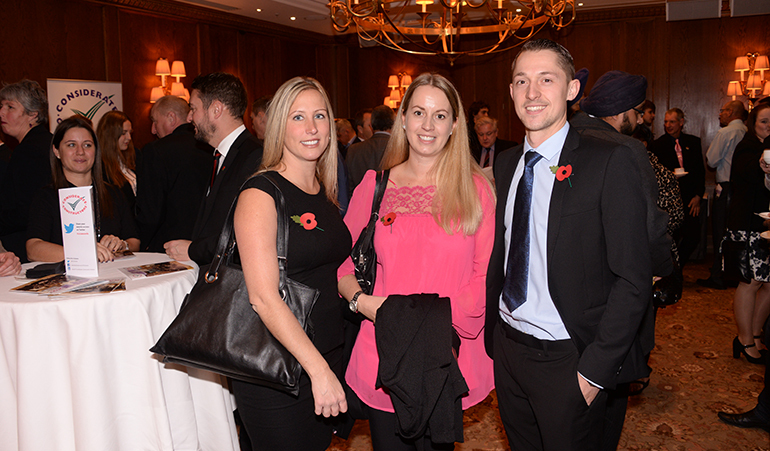 The Scheme is hugely proud to honour the great achievements of the top performing registered companies and suppliers. Over 900 companies and suppliers registered with the Scheme in the past 12 months, representing significant growth on the previous year, and making competition even tougher. With such high demand for construction activity across the UK, it is essential that the industry continues to raise standards and project a positive image to attract new talent. 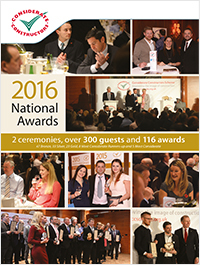 The Scheme has published a special edition awards brochure which lists all of the 2016 National Award winners. Please click here to view and download a copy of this brochure. Copies of this brochure will be posted to all 2016 National Award winners. 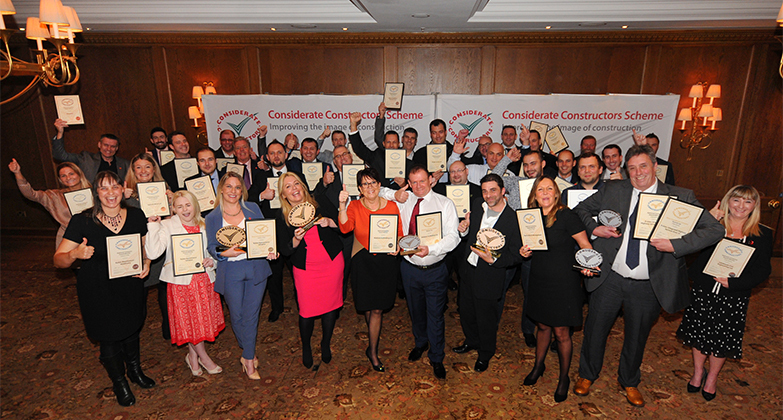 The Scheme wishes to congratulate all award-winning companies and suppliers for their invaluable contribution to improving the image of the construction industry. 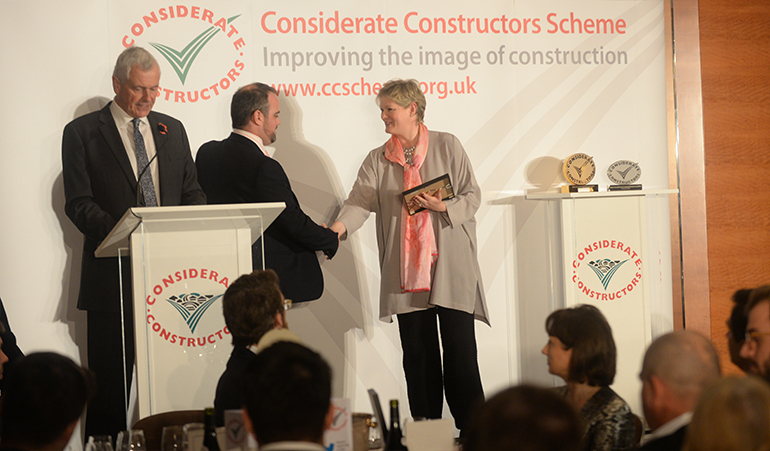 Follow @CCScheme and remember to use #ccsawards in all tweets to promote your success and join the conversation.